Being a quality centric organization, we offer a wide assortment of Wooden Soffit. The offered wooden soffit is manufactured from the high quality material in conformity with international standards with the help of advanced techniques. 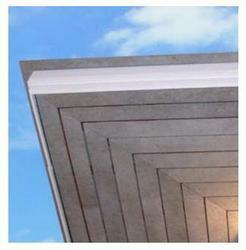 This wooden soffit is available in diverse specifications as per the needs of customers. We are giving this wooden soffit to our customers in a given time frame at nominal rates. With huge technical knowledge and industrial experience, we are providing a wide assortment of Interior Tiled Wall. The offered tiled wall is designed with high level of precision & ideal for wet area ex. wall lining for bathroom or sauna. Also, this tiled wall is known in the market for its attractive look and unique design. We provide this tiled wall in varied specifications as per the specific requirements of our customers. Looking for CEMENT BOARDS ?